What is the Pretax Margin Ratio? The Pretax Margin Ratio, also knows at the Earnings Before TaxEarnings Before Tax (EBT)Earnings Before Tax (EBT), is found by deducting all relevant operating expenses and interest expense from sales revenue. Earnings Before Tax is used for analyzing the profitability of a company without the impact of its tax regime. This makes companies in different states or countries more comparable (EBT) ratio, is an operating profitability ratio used by market analysts and investors. The ratio is useful in analyzing the standalone profitability of a company’s operations, as it excludes tax expense. The pretax margin ratio is also useful in assessing the year-over-yearYoY (Year over Year)YoY stands for Year over Year and is a type of financial analysis that's useful when comparing time series data. Analysts are able to deduce changes in the quantity or quality of certain business aspects with YoY analysis. In finance, investors usually compare the performance of financial instruments on organic growth that a company also experiences, as it focuses on the intrinsic valueIntrinsic ValueThe intrinsic value of a business (or any investment security) is the present value of all expected future cash flows, discounted at the appropriate discount rate. Unlike relative forms of valuation that look at comparable companies, intrinsic valuation looks only at the inherent value of a business on its own. that the business generates. How can we calculate the Pretax Margin Ratio? 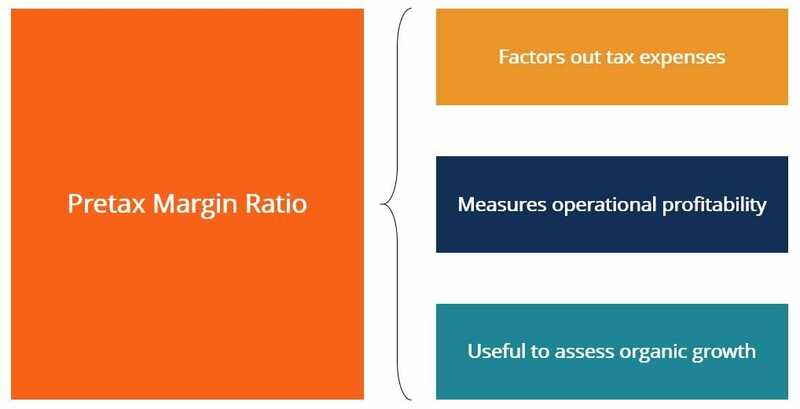 A higher pretax margin ratio indicates a company with a high degree of operational profitability. A lower ratio indicates poorer operational profitability. This means that the company is more dependent on a low-tax environment to ensure profitability. The thinking behind the ratio is that a company’s earnings growth should not be artificially penalized by high tax rates. The pretax margin ratio more clearly reveals how a company’s operations are actually performing. Also, a company’s operational profitability relative to a competitor may be overstated if the competitor operates in a higher tax environment. Thus, using the pretax margin ratio factors out extraneous tax effects a company’s performance. Looking at the numbers above, we can see that the bakery’s operational profitability slowly dropped each year from 2015-2018. While we also see that the company’s EBT is slowly declining, its total revenue is increasing year over year. 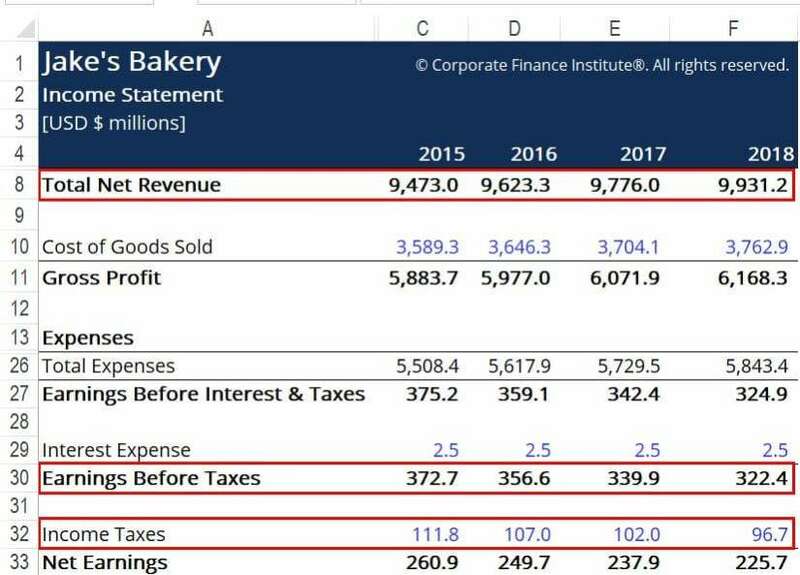 This may indicate that the company’s expenses are growing faster than its revenues, meaning that the bakery’s future profitability may be in danger. When using the preta margin ratio, it is important to compare it against the pretax margin ratios of competitors in the industry in order to draw additional insights. For instance, the rise in expenses that the bakery faces may be due to industry factors such as the increasing costs of raw materials. This will negatively affect all companies in the industry. Current Portion of Long Term DebtCurrent Portion of Long Term DebtThe current portion of long term debt is the portion of long-term debt due that is due within a year’s time. Long-term debt has a maturity of more than 1 year. The current portion of long-term debt differs from current debt which is debt that is to be totally repaid within one year.